Monolith Productions' Middle-earth: Shadow of Mordor moves away from a popular October 7 release date to September 30. Monolith Productions announced today that it has moved the release date of Middle-earth: Shadow of Mordor from October 7 to September 30. Release dates have been in flux, especially for this fall. BioWare's Dragon Age: Inquisition will launch on November 18 instead of October 7, and Battlefield: Hardline will launch early next year instead of this October. "Based on hearing fans' excitement over the latest chronicle in Middle-earth, [Warner Bros. Interactive Entertainment] will release the action game earlier than originally planned at all participating retailers," a press release states. The early release date is good news for fans who want the game as soon as possible, but it's likely WBIE also sought to launch its game before the many others coming on October 7, including NBA 2K15, Alien: Isolation, and Driveclub. It's still possible for other remaining October 7 games to delay (or unlikely push the release date forward), but if anything NBA 2K15 looks set for the date. The PS3, PS4, Xbox 360, and Xbox One versions of Shadow of Mordor will launch on September 30 in North America and October 3 in Europe, while Windows PC and Steam versions will be available on October 2. 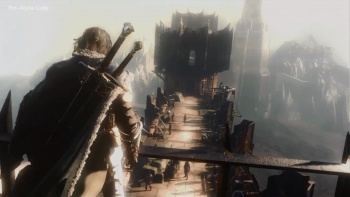 Middle-earth: Shadow of Mordor is set between The Hobbit and The Lord of the Rings trilogy. A mysterious Wraith resurrects Talion, setting him off on a quest for revenge against Sauron.